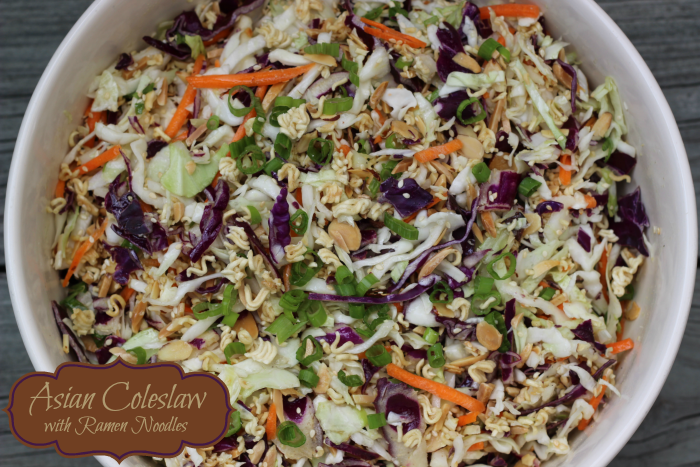 Asian Coleslaw with Ramen Noodles is a sweet-tangy side dish that makes enough to feed a crowd! The flavors & textures make the perfect easy salad recipe. The first time I had Asian Coleslaw with ramen noodles was at a pitch-in; although I can’t recall where or when or who made this fantastic side dish. Its many flavors and textures come together for a sweet-tangy slaw with lots of crunch from crisp cabbage, toasted almonds and Ramen noodles. I recently made this Asian Coleslaw recipe at a pitch-in, and doubled it (adapted from Food.com) to serve plenty and have some leftovers. I even like it as a healthy vegetarian lunch just by itself, or you could add leftover chicken or beef! 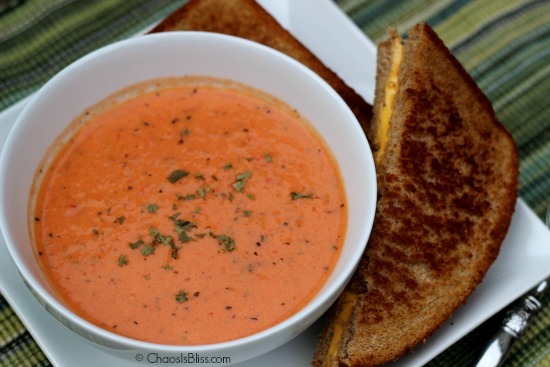 This recipe would serve 8-12; it can easily be halved for serving 4-6 people. 2 pkgs chicken flavored Ramen noodle soup mix (I used Maruchan). Set aside chicken seasoning packets for dressing. First, toast almonds and sesame seeds in the oven at 350° for about 10-15 minutes for almonds, and 10 minutes for sesame seeds (gently turning over every 5 minutes for evenness) until they have a nice golden color. 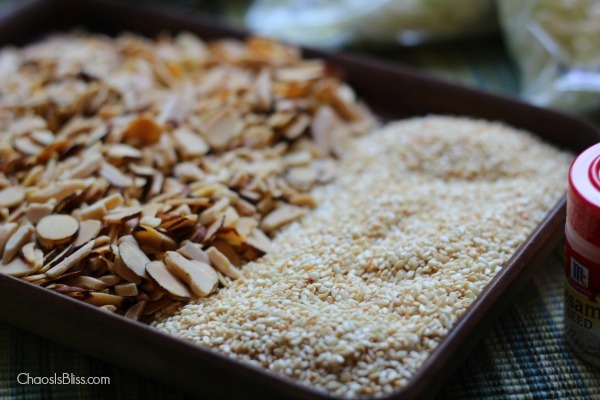 Two pie plates are great to keep the almonds and sesame seeds separate and to avoid spilling out when turning. Watch carefully to avoid burning. Next, crunch up the Ramen noodles so they’re separated. I used a Ziploc bag and meat mallet (you could also use a coffee mug). Empty the Ramen noodles into a large mixing bowl. 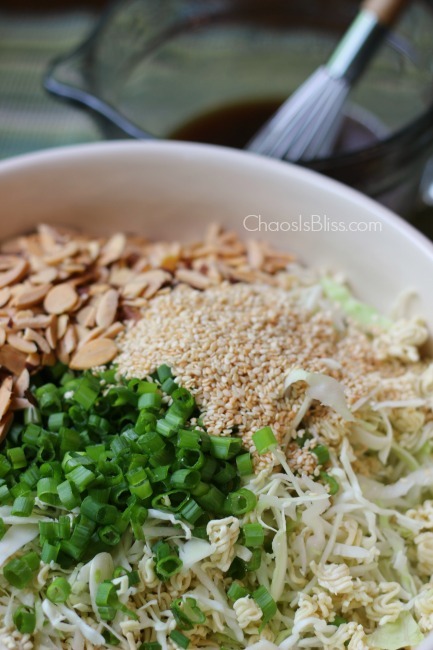 Add coleslaw mix, chopped onions, almonds, and sesame seeds. Toss gently to mix. Mix together dressing ingredients with a small whisk. Pour over coleslaw mixture and toss to coat. Refrigerate until ready to serve. I hope you enjoy this as much as I do. It has been one of my top recipes pinned on Pinterest. You can pin it here to save for later! If you’d like to print it, just scroll down for the printable version. Toast almonds and sesame seeds in the oven at 350° for about 10-15 minutes for almonds, and 10 minutes for sesame seeds (gently turning over every 5 minutes for evenness) until they have a nice golden color. Watch carefully to avoid burning. Crunch up the Ramen noodles so they're separated, using a Ziploc bag and meat mallet. Empty the Ramen noodles into a large mixing bowl. Add coleslaw mix, chopped onions, almonds, and sesame seeds. Toss gently to mix. Great recipe! I actually make the same recipe only I use a bag of broccoli slaw. It makes it a little unique for potlucks (still same great flavor). Thanks for linking up on Saver Tips Tuesday! I love this recipe, but I change it up with oriental ramen noodles and toast the noodles and amound with a touch of sugar on the stove. Wondeeful leftover to make egg rolls, Just add cooked chicken breast. and bean spouts and soy sauce. Delicious salad! Hard to stop eating once you start! I used 2, 14 oz bags of Dole coleslaw mix since that’s how they came and I didn’t want to waste any. The amount was perfect. Next time I would cut the salt back to 1 tsp. I used cracked pepper as suggested, but I think it was a little overwhelming. Next time I will cut back on the pepper too. Overall, a wonderful salad with lots of flavors and textures! SOUNDS WONDERFUL! CAN’T WAIT TO TRY WITH MY GRANDCHILDREN. HOW CAN I SAVE THIS RECIPE? I would also like to save the recipe. I think it is like one I already have but since I’m in the process of moving, I don’t think I can find it. This is way too long to save. Hi Patti, I have updated the post to include a printable format at the bottom of the directions. Just click the “Print” button! If you have a free Pinterest account you can pin it here: https://www.pinterest.com/pin/45176802491425356/. Ramen noodle salad is one of ultimate favourite thing for me ! Use ” MARU CHAN INSTANT NOODLE ” is a nice ” classic ” touch ” ! As I am a Japanese, totally loves this recipe ! Have you tried Japanese plum ” UME ” dressing on this salad …… Nice summer dressing , but reduce a dose of MARU chan noodle sausage in dressing . Then taste bud will be start buzzing in your mouth … A bit sour and crunchy salad ! Yum! 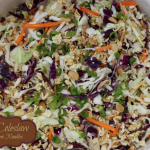 My family loves Asian coleslaw! Thanks for linking up with Merry Monday! I used broccoli slaw instead of cabbage slaw. Maintains crispness longer. I also added a little lite soy and Ginger paste to the dressing mix. It’s AWESOME! Any alternatives for not making it with almonds? Anyone try peanuts in it? Looking forward to making it with peatnuts!! Hi Stephanie did you end up trying it with peanuts? Let us know how it was! Can u make this the night before? Hi Kari, what I would suggest is keeping the toasty ingredients separate in an air-tight container, mixing up the dressing separate and refrigerating, then at the last minute toss everything together. That way the ramen etc stays crispy! Hi! I’m Making this recipe right now and it’s unclear to me if I should add ramen seasoning packet to dressing or not? I don’t see a specific list of dressing ingredients…..
Hi Dawn, towards the top of the post it lists the dressing ingredients. Yes, you add the ramen seasoning into the dressing. Hope you enjoy it!